Cooke City is a small town with that old west charm. Our town is surrounded by the mountains and has a lot to offer for those wanting to get away from it all. In the summer, you can enjoy riding an ATV, fishing, hiking, horseback trips, nature and wildlife viewing. Normally, July and August are a great time to see the wildflowers in the mountains surrounding Cooke City. Yellowstone National Park is only a few miles from Cooke City. Take a drive in the summertime over to the Beartooth Mountains or down the Chief Joseph Highway for some spectacular mountain scenery. Wintertime offers many activities such as snowmobiling, ice fishing, snowshoeing, cross country skiing and wildlife viewing. 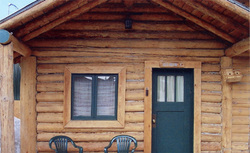 Cooke City Sinclair & Cabins offers cozy and clean cabin rentals with queen size and full size log beds in each cabin, new TV's with satellite, private bathrooms with full size tub/shower. Complimentary coffee at the Sinclair. All major credit cards accepted. No smoking, No Pets. Directions: Cooke City Sinclair & Cabins is located mid-town on Main Street and within walking distance to restaurants, shopping and the bars.